May 1, 2013 By Liz 78 Comments Note: This post may contain affiliate links. 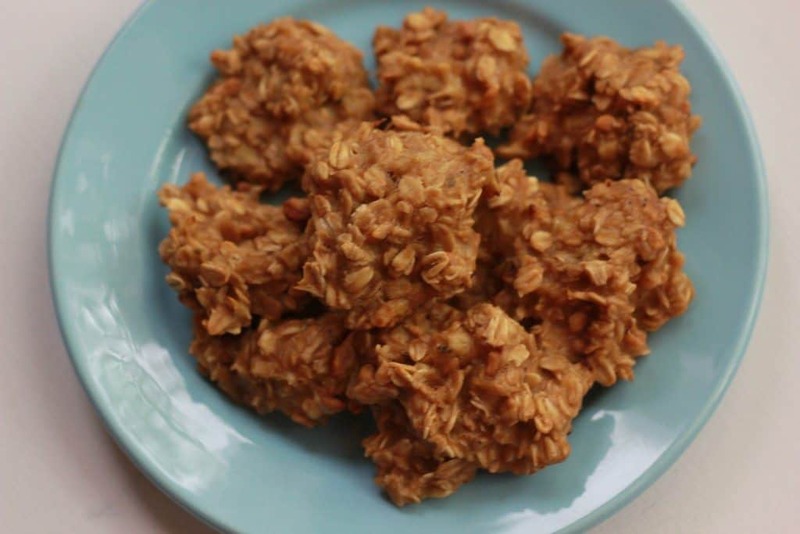 These 3 ingredient breakfast cookies are one of the easiest recipes you’ll ever make! 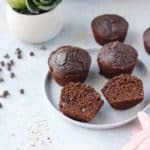 They’re healthy, vegan, gluten-free, and delicious! You can even customize them with your favorite mix-ins! Read on for the recipe! Mash all the ingredients together, and then drop rounded tablespoons onto the cookie sheet. It should make about 12 small cookies. Bake for 15 minutes. These won’t really brown, and they won’t spread, but they’ll be chewy and delicious. After just a few minutes, you’ve got fresh cookies in the oven! These will not be a decadent “dessert” cookie but they do taste good, and they’re great for a snack on the go. I called them breakfast cookies because I think they’d be awesome in the morning, but I just ate them as a snack. If you wanted more of a dessert cookie, you could definitely add some chocolate chips, walnuts, or even just more peanut butter. As the recipe is written, each cookie only has about 50 calories. Adding in chocolate chips would add a few calories, but they’d still be pretty healthy! 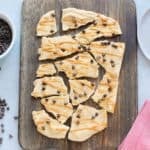 Looking for more healthy cookie ideas? 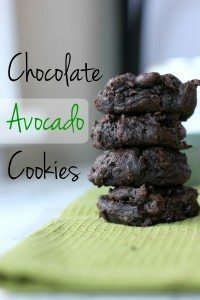 Try these chocolate avocado cookies! Do you eat cookies for breakfast? Oh no! Drink tons of water! I hope you feel better soon! I’ll be 68 in a month and I sometimes wake up feeling just like nothing else will do. Thank you! I’ve enjoyed the comments. Sorry some were sick. Yum these look awesome. I’ve bookmarked these to give them a go. Those are very healthy cookies so for breakfast I think they are a winner. Hope you’re feeling better, Liz! My allergies have been terrible so far, so maybe that’s what you were experiencing. You are so right…these cookies couldn’t be easier. 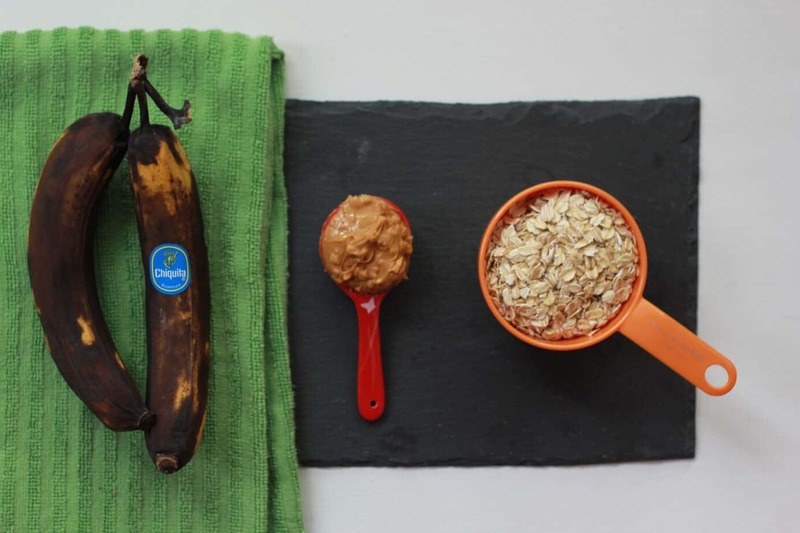 Next time my bananas get forgotten and they look like yours…I’ll try these! Thanks for the recipe, Sweetie! TOTALLY making these! I hate bananas just to eat but love them in things, and Travis never eats them all before they are overly ripe! YAY! I hope you get better soon. Those cookies sound awesome! cookies for breakfast, cookies for lunch, cookies in the morning, cookies in the evening!! I think it depends on what is in the cookie but these sound excellent! 😀 Great idea. Im down for cookies for breakfast! Great ingredients, even though its called a cookie, I’d still eat it. There are NO rules! Im all for cookies for breakfast, especially these ones. I mean I put all these ingredients into my oatmeal, so its not like these are any different!! Ohhh my gosh almond butter cookies would be amazing! Those look great! I’m all for simple, healthy, and tasty cookies! The only thing about that recipe that makes it a “cookie” is the shape so I approve of it for breakfast! Plus, I think if the only thing you’ve got to eat is literally an Oreo for breakfast, it’s better than no breakfast. Just skip dessert later. 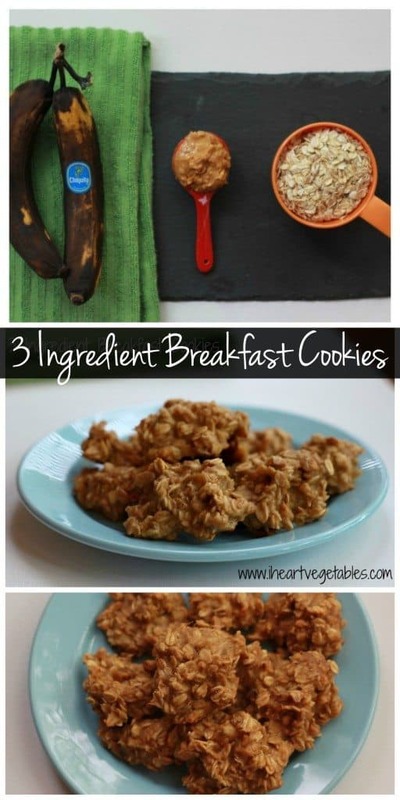 oh, the PB, banana and oatmeal cookies look awesome. 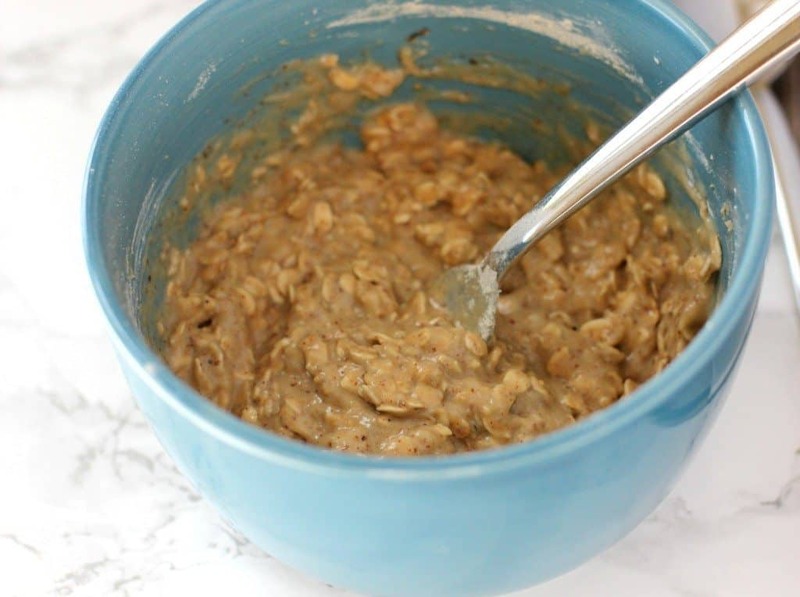 are those quick oats? I used the slow cooking kind but I think the quick oats would work! Steel cut might have a different texture but I think they’d be fine too! Yum, these look majorly delicious, Liz! I just got a random cold this past week too—it’s like, really?! It’s spring! Go away, sniffles! Wow these look great and so easy. You always have recipes that I can physically see myself making LOL as opposed to others that are too complicated and throw me into a tizzy just thinking about. Haha I don’t like complicated recipes! So I only post things I actually (can) make! Those cookies look outrageously simple and delish! Those look awesome! I hate the day before you get really sick, because you’re living your daily life but know something is up! Yes!! It’s the worst, knowing it’s coming! Cookies for breakfast, lunch, and dinner would be fine with me! A friend of mine made something similar the other day, except she didn’t use PB. I like that you added PB…I would definitely add the chocolate chips. 🙂 YUM! So…drizzle these with honey and you’ve basically turned the best sandwich in the world into a cookie? I’m definitely feeling tons better! They sound like my kind of cookie! We are a vegetarian couple. We created a brand of shoes called Milkies (the shoes come in a Milk box – the Milk box says as a joke:”May contain traces of soy-milk but absolutely 0% cow milk “). We started to sell the shoes this year. They were sold in France. We sold everything. Next year we want to become much more engaged and promote the vegetarian. We will have the following initiative: Buy 1 pair of Milkies = Give 1 nutritive veggie meal to a child. We have a website and we are creating a video at the moment and we are looking for some vegetarians to give us their opinion. If you are interested and you want to give us your opinion and advice, we will really appreciate it if write to us at benoit.raimond@gmail.com. Then we will show you more in detail what we plan to do. Oh and before I forget! Thanks Liz. Super blog. Hi Liz! Hope you’re feeling better today. I nominated you for the One Lovely Blog Award. Thanks for all the great blogging you do–keep it up! Ah I”m totally pinning these. 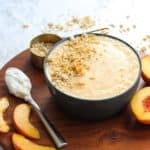 This is my kind of recipe- healthy and easy! These cookies looks so yummy! Hope you are feeling better! You know me…I am ALL about some dessert for breakfast and I will take it ANY way I can get it! Love how simple this is…and yet still so versatile! I can definitely see some nuts and or dried fruit going in these! Oh and they would be great crumbled over some yogurt! Glad to hear you’re feeling a bit better! I definitely believe in the healing power of food…that smoothie was your magical elixir for sure! Haha! I keep seeing 2 or 3 ingredient cookies on Pinterest and want to make them. And now this post makes me want to try your version! They look so easy and tasty. Hello, i believe that i saw you visited my site thus i came to return the prefer? .I am trying to find things to improve my web site!I suppose its adequate to use some of your ideas! Każdy spośród nas zetknął się z faktem, zalecam zapoznanie się z faktem. 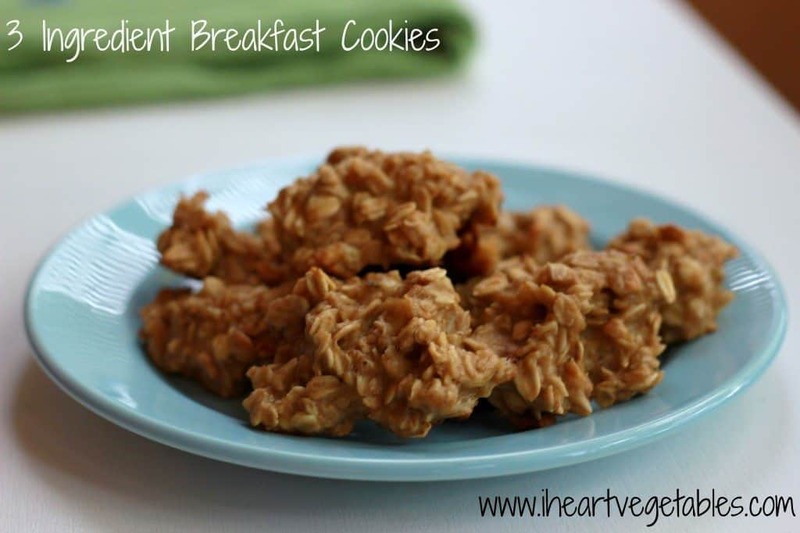 I love the idea of cookies for breakfast! And I’m on the lookout for recipes. 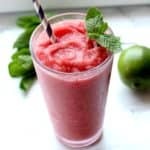 This one is perfect; easy & healthy! Stopping by from Katherine’s Corner. Perfect to have on hand for busy mornings. Very budget friendly! 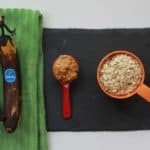 Love this idea of using up browned bananas for healthy breakfasts! Thanks for sharing at Merry Monday! 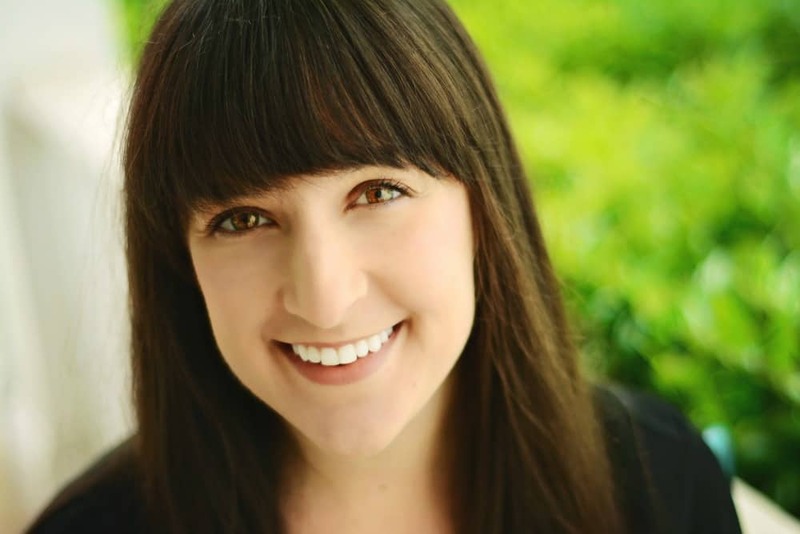 I’m so thrilled to have stumbled across this blog! Lots of great recipes! I’m so glad you stopped by, Stephanie!